Hot Wheels® Goes Vertical at X Games Los Angeles 2012 with Six-Story Double Driver Loop World-Record Attempt | Mattel Inc.
EL SEGUNDO, Calif.--(BUSINESS WIRE)-- On Saturday, June 30, Hot Wheels strives for another world record with a gravity-defying, two-driver double vertical loop attempt at X Games Los Angeles 2012. The life-sized Hot Wheels Double Loop Dare will pair Team Hot Wheels™ Green and Yellow Drivers together to simultaneously race through a harrowing six-story vertical loop in a first-of-its-kind challenge. As part of a new relationship with ESPN, the Hot Wheels Double Loop Dare will be broadcast nationally on ABC and globally on ESPN's international networks, giving fans everywhere a front row seat to the action. 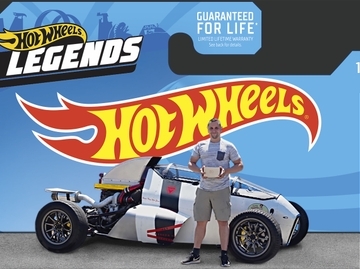 "We're continuing to push the boundaries of imagination by creating extraordinary real world challenges that bring Hot Wheels to life on a global scale, exemplifying the fearless and competitive spirit of the brand," said Simon Waldron, vice president marketing, wheels, Mattel. "Our relationship with ESPN allows us to leverage the world's premier action sports stage to engage a passionate fan base who share our excitement of thrilling vehicle experiences." The Hot Wheels Double Loop Dare, modeled after the new Hot Wheels Double Dare Snare™ track set, available globally at retail, lets boys race their 1:64 scale Hot Wheels cars side-by-side in a vertical loop competition. Fans around the world will watch in awe as the two drivers accelerate to 52 MPH to enter the six-story tall loop, hitting 7 Gs as they circle through. The G-force created in the Hot Wheels Double Loop Dare will be equivalent to what fighter jet pilots experience in flight. In 2011, Team Hot Wheels achieved the impossible - landing a 332 foot distance jump at the 100th Indianapolis 500. The epic feat earned Hot Wheels the world record for a four-wheeled vehicle distance jump and a new-found respect from fans around the world. Team Hot Wheels is comprised of the most fearless and skilled drivers in the world. Each team driver is exemplified by a unique personality and driving style, and they take on only the most outrageous stunts. The Hot Wheels Double Loop Dare will be attempted by the Green Driver, known for his need for speed, and the Yellow Driver, recognized for using his power to push the limits. Tanner Foust (Team Yellow) - a three-time X Games Gold medalist, two-time Formula Drift Champion and also earned Hot Wheels the coveted world-record-breaking distance jump at last year's Indianapolis 500. This year Tanner will also be competing at the X Games in Los Angeles in the Rally-cross circuit. Greg Tracy (Team Green) - one of the top stuntmen in Hollywood, Greg has been doing stunts for movies and commercials since 1991. He is also a six-time Pikes Peak Champion - one of the most extreme racing events in the world. 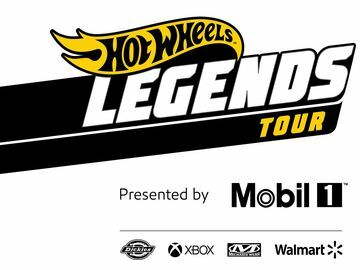 The Hot Wheels Double Loop Dare at X Games Los Angeles combines the iconic boy brand and the world's premier action sports competition and lifestyle brand. "The Hot Wheels Double Loop Dare is a great addition to the X Games experience. Hot Wheels is bringing to life what so many kids have dreamt about over the years while playing with their Hot Wheels cars," said Tim Reed, ESPN senior director, content strategy. "We're excited about our relationship with Hot Wheels and adding this entertainment spectacle to an exciting four days of world-class action sports competition in downtown Los Angeles." In the U.S., fans can tune-in to watch the jaw-dropping Hot Wheels Double Loop Dare challenge on June 30th on ABC at 11:20 AM PT. Additionally, the Hot Wheels Double Loop Dare attempt will be webcast on www.HotWheels.com. In 2012, Hot Wheels will unveil 19, live-action webisodes on www.HotWheels.com. Boys will be able to follow their favorite Team Hot Wheels drivers as they attempt the most outrageous stunts imaginable at the Hot Wheels Test Facility™. Additionally, leading up to the X Games, boys can vote on which driver they believe will have what it takes to come in first in the Hot Wheels Double Loop Dare challenge. Now through June 29th, fans can see exclusive behind-the-scenes content and vote daily on the Hot Wheels Facebook page for which driver they think will finish first in the Hot Wheels Double Loop Dare. Select fans in the United States who pick the winning driver will be entered into a sweepstakes to win a special-edition 1:64 die-cast car.